Spring shoes are always about passion and style, and given that the season comes after the dark range of trends from the fall, the new elements are always worth looking forward to. If you are a fashionista, who follows the runway trends and like to be a part of the rules set by the fashion police, here are some of the best spring trends in shoes for 2015 worth your indulgence. Sneak more with the sneakers: The best thing about sneakers is the easiness and comfort, and most designers who have worked with sneakers agree that their customers love the trend. This year, Burberry came up with these amazing multicoloured sneakers, and the look is worth drooling. You don’t need to go multicoloured necessarily, but sneakers can be cool in single colours too. Click here to check some amazing sneakers for your closet. Gladiator boots and sandals: Gladiators weren’t always considered to be the best style in shoes, mainly as the design doesn’t quite flatter the legs in the right proportion. It seems like the designers want to change that with the spring 2015 collections coming with endless designs in gladiators. From the cut-out designs to the lacy elements, there is always something for every lady. The amazing use of heels and proportions of the length also adds to the benefit. If you check the collection at Alexander McQueen, you must have spotted a pair. Flats and more flats: Flats have two essential advantages over heels. Firstly, you can wear one almost anywhere without being too conscious, and secondly, you don’t really need to be uncomfortable thinking of where you tweaked the step. Spring 2015 had some great flats, mainly the ones that said ‘less is more’. Some designer brands like Balenciaga came up with the idea of pointy toe flats, while you can also find the simple slide-in shoes in major collections. Make sure to use your favourite colours this time! Slide- in designs: Slide-in shoes are another kind of comfort genre designs, where you can get into a pair with ease at any time of the week and for almost anywhere. While for work, you need to be extra bit of conscious with the minimalistic approach, the casual days can be as fun as you want. 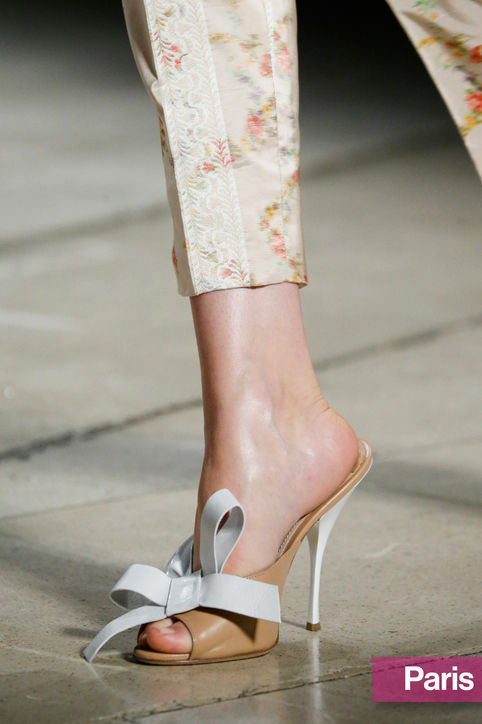 The heels too can vary in more ways than one, like Miu Miu came up with bow mules with high heels. If you are buying shoes online, make sure to invest in different kinds of pairs in the same trend. Among the other trends that are worth mentioning is the coming of platforms and loafers. In fact, ankle-strap loafers were like a fresh change in the routine. Get your fashion fix now! This entry was posted in Fashion and tagged Fashion, fashionista, flats, shoes, sneakers, SS15, style, Trends.